Today I Roasted some zucchini, onion, 2 potatoes, and butternut squash to make the week go smoother. 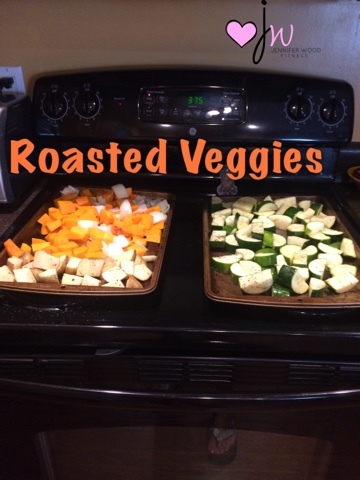 I love having prepped veggies to grab on busy days. They were on there way to the veggie drawer graveyard, but I don't like wasting money, so in the oven they go! *Here I am to save the day!!! 💃Toss the vegetables in 1-2 tbsp melted coconut oil or olive oil, sprinkle with sea salt and pepper and roast until done. You can add chipotle seasoning or Italian seasoning to give it a different flair. Roast at 400* for 20-30 minutes; check halfway to see if you need to stir the mixture. You can put all the vegetables on one large cookie sheet.